During a random internet browse, I ran across the Victoria Tea Festival web site. 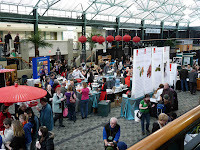 Started in 2007 as a fund-raising event benefiting the Camosun College Child Care Services, the festival showcases all things tea: teapots, tea cups, tea cozies, tea whisks, tea scones, and tea itself. Well, I love all things tea and there was a package deal with the Victoria Clipper. This was our first trip on the Clipper. We ususally go to Victoria on the ferry, either from Anacortes through the San Juan Islands or from Tsawwassen through the Gulf Islands. Both are picturesque trips but take most of the day. The Clipper takes 3 hours, leaves from Seattle and we could leave the car at home.